We Proclaim the Season | Sprezzatura, Y'all! I never cease to be amazed at this town. And the Italians. 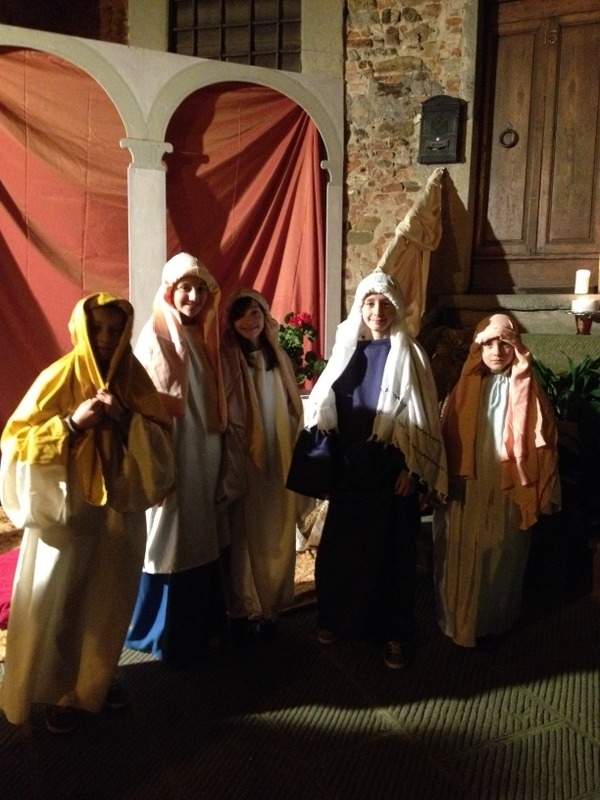 Last night was the Anghiari Christmas processional and Steve was asked to play a role. Sure, we said, and we proceeded to ask questions about what, when, where, what time, etc. All the things you would want to know if you were participating in some kind of Christmas thing in a foreign country. Granted, we don’t speak their language very well and they don’t speak ours at all, so it was difficult getting any answers. Every time we would ask, it would be a vague answer – for instance, what time does it start would be answered with “Oh, 6:00, 6:30, 7:00″. Not helpful. Where? would be answered with a gesture indicating all over town. Did that mean Steve was to walk all over town? Did he walk with other people? Who did he follow? Where did it start? This is where that word that we love so much comes into play – tranquillo. Just be cool and it will all come to you. fabric draped over our rail and carpet laid on our steps. It went with the scene they were setting up next to our door step. That’s when it occurred to me that this might be a little bigger than we had imagined. There’s a little storage room next to our apartment and it had been turned into ground zero for our neighborhood’s staging area. Costumes, scenery and all kinds of stuff had been stored in there. Where were we when all this was taking place? We live right next to it – we never noticed anyone coming or going from it. So much we were clueless about. We pieced together a little here and there and figured out that Steve did not join the processional. He stayed here. We also figured out where the processional started. At the ancient old church at the top of town. So I went up there to take pictures. That’s when I discovered that each neighborhood had its own scene set up. There were probably about 10 in all. I further discovered that they whole thing started with a mass in the ancient old church. This church is tiny and it was packed to the gills with townspeople. I stood outside to wait and see what happened next. About 6:45 or so the doors opened and a procession came out, lead by the priests and followed by men in white cloaks and then men in black cloaks. Then the congregation. I slipped in behind the black cloaks. 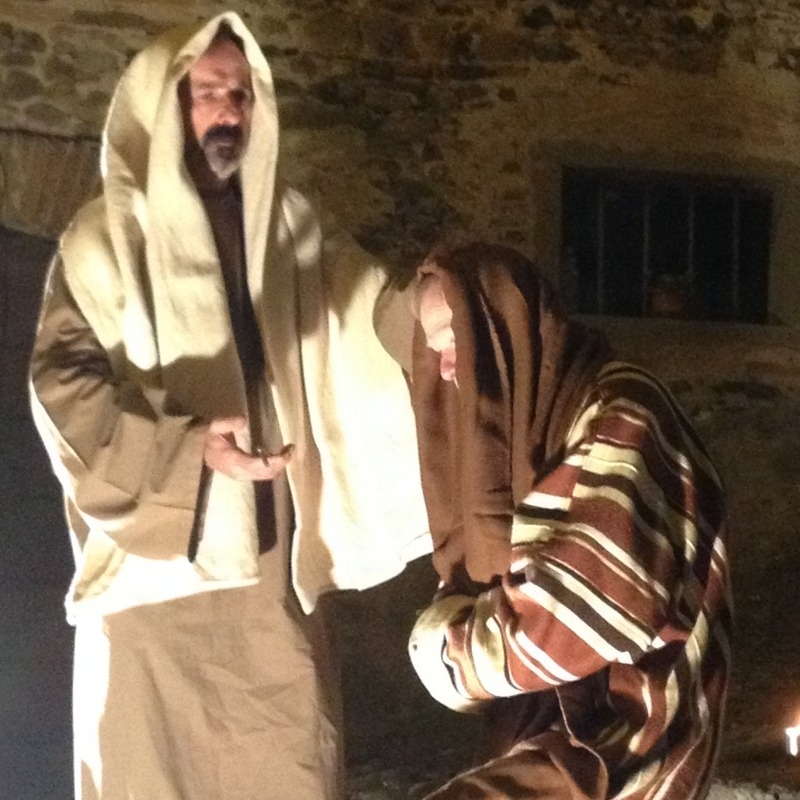 The priests led the followers in chants and singing and we walked around to the first scene. I figured out that everyone followed the priests on a tour of the various vignettes, with lots of signing and recitations in between. The entire town was lined with candles – every window sill, every street, every staircase, every wall. It was absolutely gorgeous. 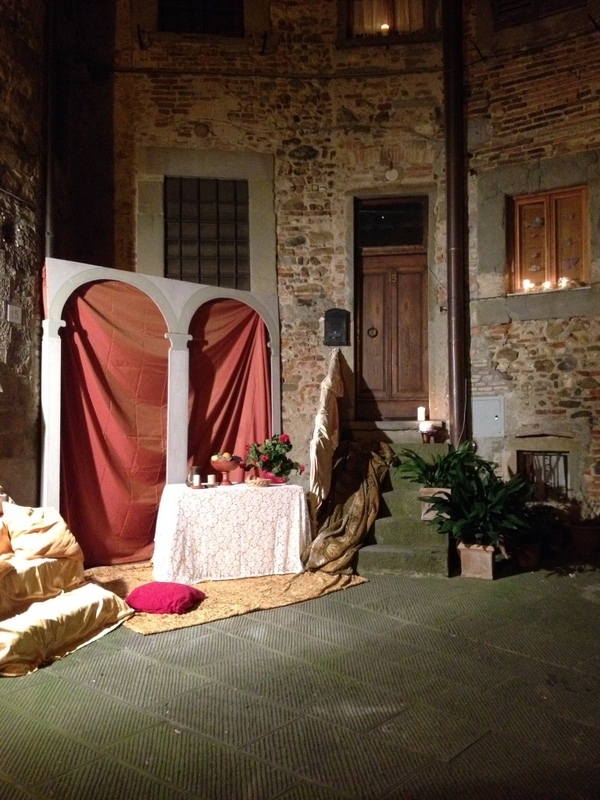 The night was cold, but very clear and the candles made this medieval town take on a golden glow. Plus, the white cloaked and black cloaked people were carrying torches as they led the procession through town. I’m not sure what the significance of the cloaks are – I will try to find out. It was a little ominous seeing this procession marching toward you with their torches burning. You had to remind yourself this was a celebration, not a brute squad. At each vignette the procession paused and the priest read scripture and said a little something. The theme was mercy, I’m sure because of the Jubilee year of mercy that had just been proclaimed by the Pope. Then the procession would begin again with the singing and recitations until they got to the next one. It was called quadri viventi, or living paintings, and that’s what each vignette was – a living painting dramatizing the scripture and telling a story. Steve played St. Peter receiving the keys to heaven, or the church, we weren’t sure. Regardless, it was important and very powerful. It was a wonderful thing to be a part of. And the most amazing thing to me is how this all got done. I’m sure they had meetings and discussions and decided who was going to do what, but to us the whole thing just spontaneously happened. We live here and if our neighbor Jonpietro had not asked Steve to participate in this, we wouldn’t have known anything about it. There was not one sign, poster, anything telling about this. Mind you, there are signs around this town for everything – from concerts to nature walks. But nothing for this. This is something that everyone knows about and is something just for this town and I guess they don’t need signs announcing it. All the planning, the making of the props, the costumes, the displays took place without our notice. Then they magically pulled it all out from the hiding places and put it in place in just a couple of hours. Before that, there was no sign that anything special was taking place. Amazing. 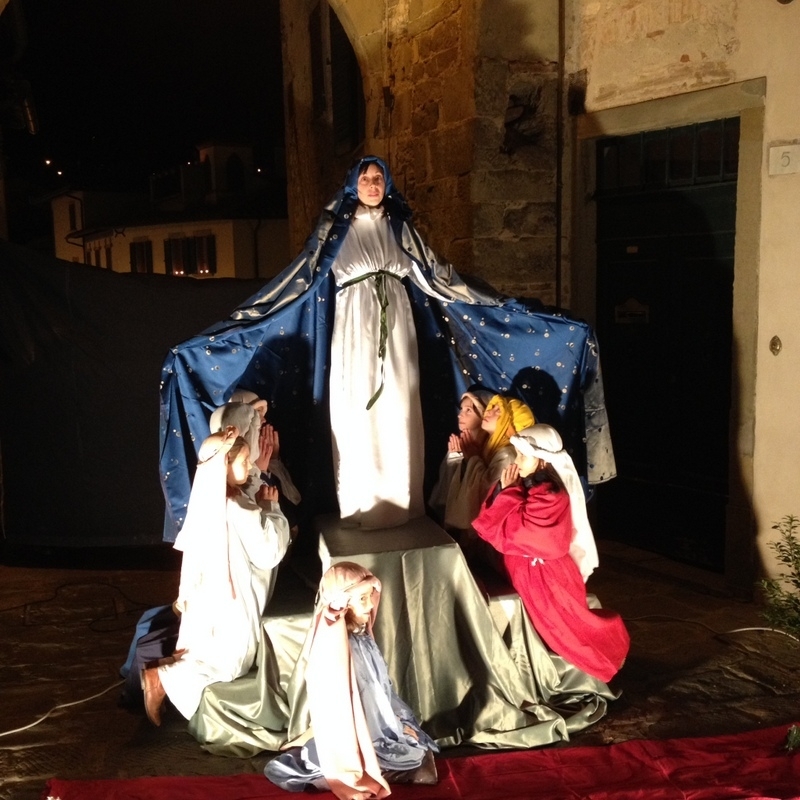 So we have officially started the Christmas season in Anghiari. It began with a tradition that goes back many years and is solemnly observed. It was completely and absolutely religious. There was nothing politically correct about any of it. 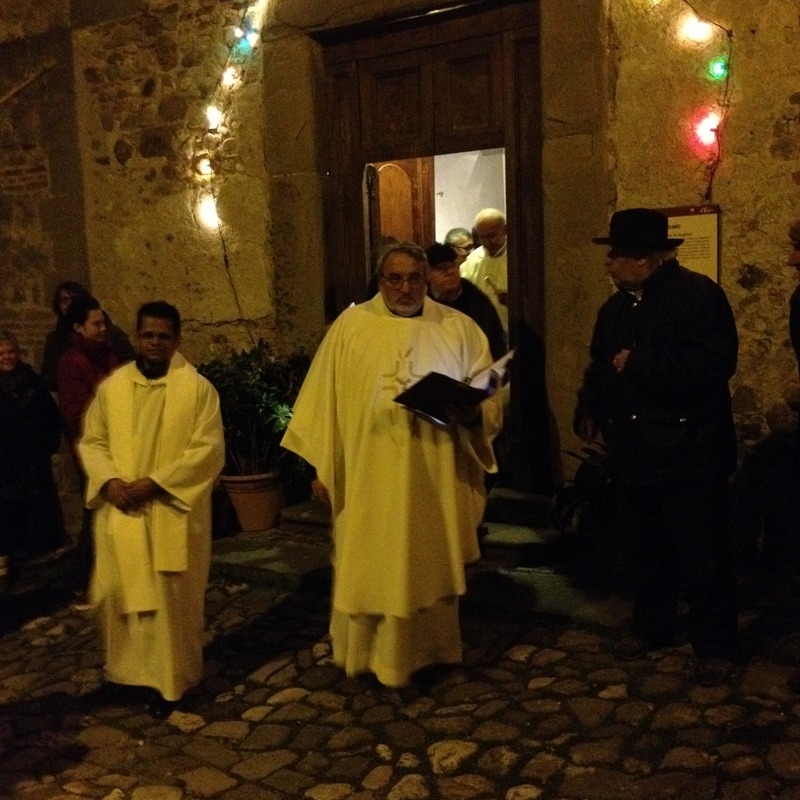 As tolerant as I am about respecting the rights of all to believe what they choose, there was something perfectly right about this small Tuscan town kicking off Christmas by the priest leading everyone through a living scripture. I’m not Catholic, but I appreciated it and thought it was a very nice way to celebrate the season. It made me feel good and peaceful, things I sometimes don’t feel at Christmastime because of what it has become in the U.S. A mad dash of parties, shopping, traffic and stressed out people. Trust me, this is a much better way to usher in Christmas. This has to be one of the most unique experiences yet!What a memory to always hold in your hearts!Steve fills the role quite well! It was one of the best things we’ve ever done. Well, Steve did it, I just watched. It was absolutely magical. I wish you could have been there to experience it. I love it that Steve was St. Peter. Apparently, Jonpietro did not need to speak English to know that Steve was the best man for the job!! What an honor!! It was perfect! Steve got many compliments from the crowd on his performance. I was shocked that he held that pose for so long – tough on the knees!